My mother-in-law is about to celebrate her 87th birthday which in itself deserves a really special card but she also happens to be one of my greatest supporters as a card-maker - so I wanted to pull out all the stops! I've seen, and admired, some accordion cards by Omelliesdesigns and spent a bit of time working out a similar design that would work for my purpose. Only the ribbon closure on this Accordion Card gives an indication that there's more to this card than meets the eye! I used Rich Razzleberry card stock to make the card and added a panel to the front that I had cut with the Balloon Pop Up Thinlits. 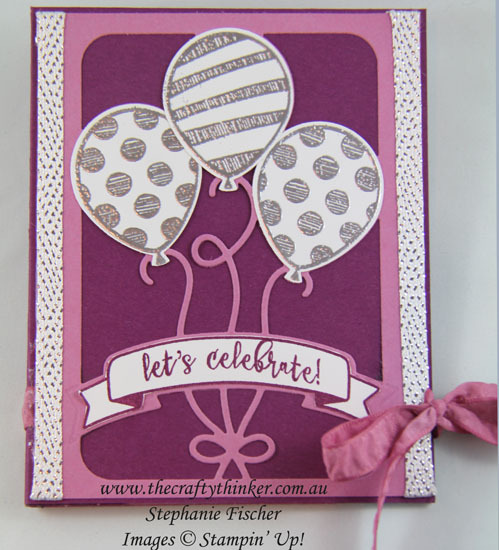 I used the matching Balloon Adventures stamp set to silver heat emboss the balloons onto Whisper White cardstock and punched them out with the Balloon Bouquet punch. I stamped the banner and greeting with Rich Razzleberry ink and hand cut the banner. I hid the edges of the panel with some of the Metallic Ribbon left over from Sale-A-Bration. I adhered the Ruched Ribbon (for the closure) before adding the decorations to the front of the card. 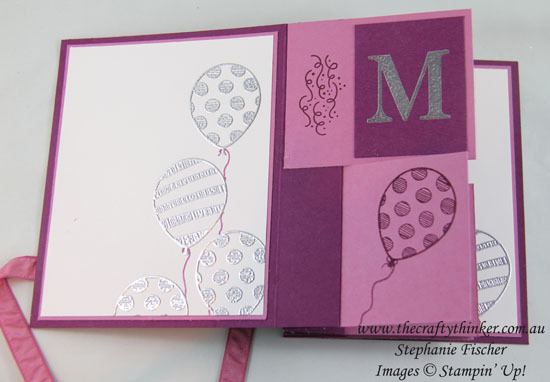 The inside of the card is decorated with Silver Heat Embossing, Rich Razzleberry ink and the Balloon Adventures stamp set. There's quite a wow factor when the card is fully opened to reveal the message! Since my Mother-in-Law's vision is a little impaired, I used a retired stamp set, called Sophisticated Seriphs, because it has large, clear letters. I also used the Number of Years stamp set for the age.